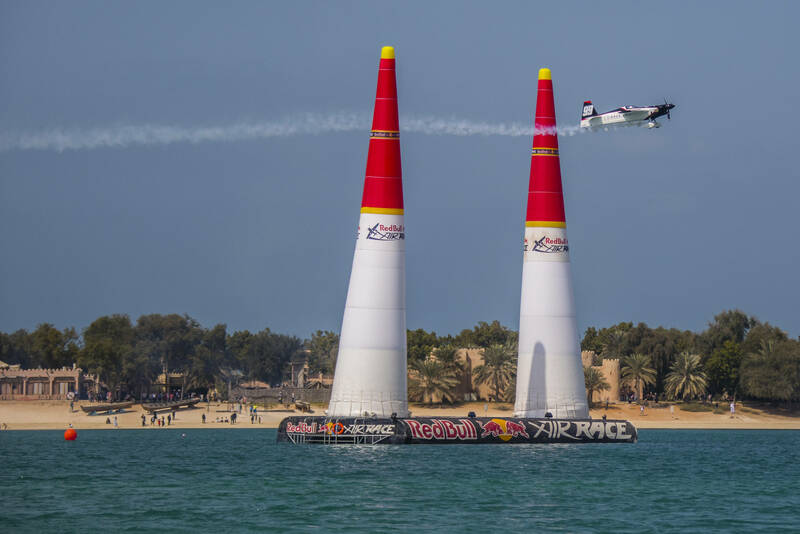 After finishing 2016 with a breakthrough, the USA’s Michael Goulian is kicking off the new Red Bull Air Race World Championship season in Abu Dhabi on February 10-11 with energy, confidence and the best team he’s ever had. American pilot Michael Goulian smiles when he remembers the 2016 Red Bull Air Race season finale. While the race was literally a blow-out, with high winds toppling the pylons, one of the toughest days in the history of the sport was a turning point for his team. Red Bull Air Race pilot Michael Goulian settles into the cockpit of his Edge 540 race plan in Abu Dhabi. In fact, as Team Goulian prepares for the opening race of the 2017 World Championship in Abu Dhabi on February 10-11, they’re even better prepared than they were in Las Vegas. In the off-season, they continued their collaboration with engineers from the Brazilian company Advantage Engenharia, who have contributed to improvements for Goulian’s Edge 540 V2 raceplane, including previous aerodynamic enhancements and engine air and cooling systems. Because the off-season was so short, the team still has plenty of assessment to do before they’ll know just how much the refinements have enhanced their performance, but in the two test runs they squeezed in before shipping the Edge to Abu Dhabi, they could tell that the raceplane was faster. According to Branco, the team’s pilot may be even better, too. He goes on, “Michael flies better when he’s allowed to be an athlete inside the cockpit. Las Vegas was the race where that happened; we somehow figured out a way to disconnect him from all of those parameters, numbers and complicated calculations. He just knew where the fastest line was, went out and flew it.” “Just go out and fly it” could well be the mantra for Team Goulian in 2017. The switch to a new technician, Warren Cilliers, mid-season last year proved to be a perfect fit in both temperament and skill, as he solved nagging technical issues on the way to optimizing performance. And trusted race strategist Steve Hall is already well integrated in the mix. After trying so hard – maybe too hard at times – to get up to speed, finally they know they’ve got the goods to deliver. While the World Championship celebrates its 75th race in Abu Dhabi, Team Goulian will be looking to generate their own reasons for celebration as well.